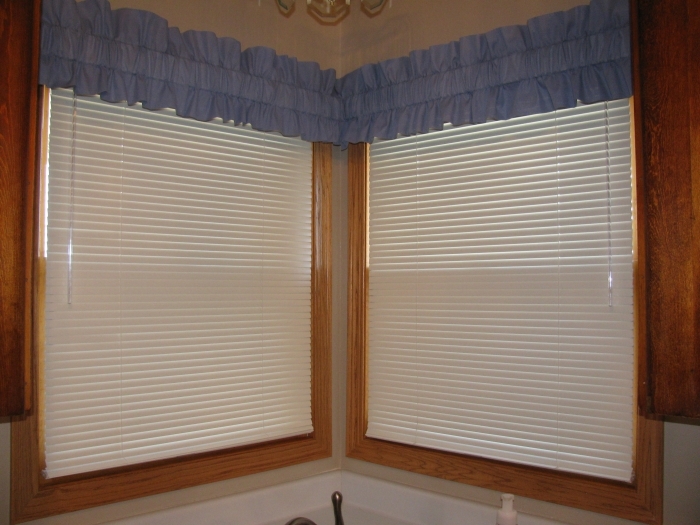 This Rod Sleeve Topper is a unique profile valance topper it is self lined. The valances has a 3" header, 3" Footer & 3" Pocket. This custom look is designed to hang easily on a 2 1/2" wide pocket rod or a decorative wood pole. The fabric is 70%polyester/30% Cotton that is machine washable. For proper fullness use approx two times the window width in fabric. For wider windows use multiple toppers. Just hat Iâ€™d been searching for. The look and color was perfect. Will buy more in the future! Looks nice! Right size! We buy more for other windows. rod sleeve Topper - sage - very nice. Looking to buy a few of these. Does anyone know what color they are lined with? Are they lined with the same color as the curtain or white? Thanks in advance. I was looking for a little something to replace some heavy valances and these work out nicely. Made well. Ordered the color Merlot (Burgundy) and is true to color. Made well. Ordered color Merlot (Burgundy) and is true to color. Looks great. Will be ordering a set of navy next. Great price too. I was very pleased with this purchase--pricewise and quality-wise too. This sleeve topper is perfect! I was looking for something that would hide the mini blinds at the top of the window but not block out too much sunlight and the sleeve toppers are perfect. They arrived very quickly and I'm impressed with the quality and color. I would definitely order again. Excellent merchandise arrived on time ,perfect fitting and perfect color shade. The rod sleeve toppers were just what I needed and arrived in a very timely fashion!! Thank you! Item was of nice quality and great price! ProsNice weight to material looks great! Very affordable and I am pleased with the product. I have purchased from Swags Galore in the past and have always been pleased. These Rod Sleeve Toppers look great in my master bedroom and adjoining bathroom. Excellent craftsmanship and a perfect fit. Great customer service as well. I have been looking all over to replace a swag in my dining room and have had no luck. It seems that swags are no longer a curtain of choice. I was delighted to find your sight and am very pleases with my purchase. I love the way it looks! I needed something that was less than 10 inches wide, and this fit the bill! The fabric looks great and holds its shape. Would buy it again! Ordered these to go in our newly remodeled kitchen. Absolutely love them. Excellent quality and just what I wanted. Just painted the MBR, installed new carpet, working towards selling my home. Needed attractive, yet inexpensive, window covering. Paired these swags with insert valances for a light, airy, and attractive new look. Was a bit concerned with the high-sheen yarns when I opened the package, as they didn't look that shiny in the photo. Put them through the rinse cycle to soften them up - they dried quickly, no wrinkles! Once on the windows, you don't see the high sheen, and they hang well. Another great buy from Swags Galore! Wonderful company to deal with. Order was right on time as promised and the curtains were beautiful. Just the right amount of color for the bathroom,.a great touch to the room. It was quickly shipped and was just how it was described. Thanks. Toppers arrived very quickly and were of nice quality. Would order from Swags Galore again. ProsVery nice quality, and value. Needed a little something on Den windows, and these worked out great! Very happy with this item. The price can't be beat and topper was well made. It looks great in my home. ConsI only wish this item came in a few more colors. Topper looks good on window, delivery was fast, and price was really good! You have always been prompt with my orders. The product is very good. I love the narrower size, it gives jsut enough color without blockingthe view out the window. Very well made and I love the design. They have the light and airy feeling which is good for me because I have a small condo. I had looked for more than a year to find something to add a touch of color to my living room windows that have designer blinds on them. I did not want a large valance or curtain that covered the window or distracted from the decor. The rod sleeve toppers are perfect. They are exactly what I was looking for! Toppers were exactly size and color I was looking for. Worked well for two small dining room windows. This sleeve topper is exactly what I was looking for; so happy to find it at Swags Galore! It arrived quickly, fabric quality is good, price was great. What more could you ask for?! Great response time. Really liked curtains. Received in one week time frame. Needed short valances for windows in log cabin. Spent weeks looking everywhere. Found this website SwagsGalore and was amazed at quantity of choices and great prices. Bought these Rod Sleeve Toppers and when they arrived they were perfect, great quality and made in USA. Immediately placed second order for these in different color. Product also arrived very fast. ProsExactly what I was looking for, great price and great quality.